This immaculate beach front property on the Gulf of Mexico with just 30 units, offers breathtaking views of an expansive beach from the livingroom and master bedroom balconies. 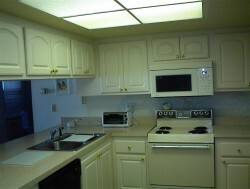 This charming 2 bedroom, 2 bath second floor unit is fully equiped and attractively decorated. In addition to the heated pool and sundeck, enjoy 2 gas barbecues and private underbuilding parking. 2 bedroom, 2 bath gulffront unit. Large 1100 sq ft. layout, will sleep up to 6 people with queen in master bedroom, 2 twins in second bedroom and 2 sleeper chairs with a twin bed in each. Beautifully decorated with upscale furnishings, ceramic tile in kitchen, livingroom, diningroom and carpet in bedrooms.